Have you ever attended a private movie screening or sneak preview? It’s a promotion strategy to create a buzz of excitement around a new movie before its general release. Similarly, one of the most effective strategies for starting a new church is the Preview Service. Like a private movie screening, Preview Services introduce the community to a new church that has not yet been released to the public. At a Preview Service, the community is invited to see what your church will be like at the Launch (or Grand Opening). Previews give your church the time to build momentum while providing you a chance to test drive the facility and the service you are designing. It is similar to the soft opening of a restaurant, when friends are invited before opening to the public. Just as excellent food and service are required at a soft opening, excellence is required at a Preview Service. Previews are not abbreviated versions of your church service. And they are not relaxed rehearsals where you work out the kinks. During Preview Services, the momentum builds over a period of four consecutive months. The typical strategy is to hold three preview services, one per month followed by the Launch in the fourth month. Launching a new church was once considered a one-time event with everything riding on it. You’re launching with new people, new equipment, a new facility, and everyone is inexperienced. By holding Preview Services, your team has the opportunity to hone their skills and get necessary experience under their belts. Previews allow your church to build critical mass before the Grand Opening. Would you rather walk into a new church and be greeted by a room full of empty chairs and twenty people, or a room filled to capacity with 200 people? Many first-time guests prefer to remain anonymous and “kick the tires” on a new church, and it is difficult to remain anonymous in a room with twenty people. If a room is three-quarters empty, it does not have the critical mass needed to provide a safe environment for guests. Each Preview Service is designed to build upon the previous one. The goal is to always have more people at the next preview. This growth continues to build momentum and excitement among the people as the Launch approaches. As the pastor, you’ll want to make sure the room is full for the Preview Services and the Launch Service. A full room will require some work for you and your Launch Team. First, ask your Launch Team to make a list of ten people they are going to bring to the services. After they have made the list, ask them to give it to you. One week before the event, call each member of your launch team and ask about every person on their list. Pray for each of those people by name. If you have 25 people on your launch team and each brings ten people, you will have a critical mass. Enlist temporary workers from other churches. Ask sponsor or partner churches to commit a group of people for the Preview Services and Launch Service. This enlistment accomplishes two things; one, it takes the stress off your launch team to handle the entire ministry that day; and two, it fills the room. At The Springs, we love to send teams to help new churches with Preview Services and Launches. These teams help with setup and breakdown, children’s ministry, as greeters, ushers, and parking ministries. Locate some churches that may be unable to give you money but can send mission teams to help you launch. 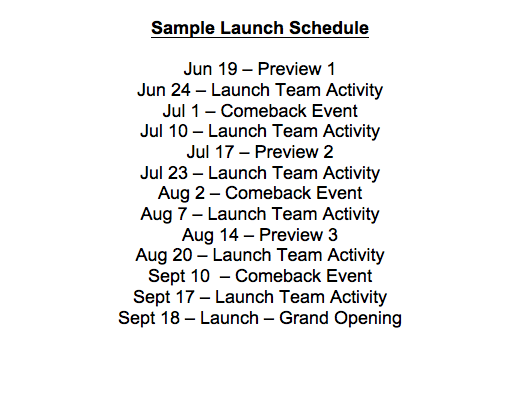 After each Preview Service, plan a Comeback Event for visitors. A Comeback Event is not a big event but an opportunity to connect people who have attended a Preview Service. It is designed as a smaller gathering allowing more personal interaction with people as they consider becoming part of your church. During the Preview Service, invite them to come back in two weeks for a party or picnic or any type of social gathering. Comeback Events are also great opportunities for people to get to know the staff. As the pastor, use the opportunity to cast vision for the church. Make sure to invite them to the next Preview Service, and even provide opportunities to serve in some capacity. Have plenty of printed invite cards and information about the church available for them. They may want to invite others. Preview Services, Comeback Events and Launch Team Activities form what we refer to as the “W”. 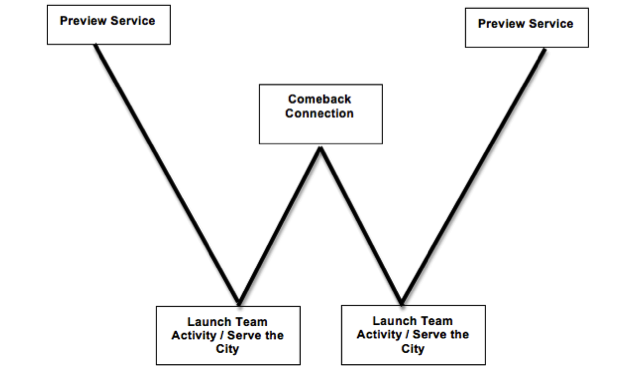 Plan a Launch Team Activity a couple of times each month. Mobilize your now-expanding Launch Team to serve the city as a team, pass out invite cards or hang door hangers. The greatest way for your people to catch the vision is to experience it. Be sure to take your Launch Team to a place they can experience the vision ten years down the road. You are strengthening and developing your team while serving your community and spreading the word about your new church. At the heart of your four-month launch commitment is your willingness to take a faith-based risk. From the moment you kick off the first Preview Service, there is a greater commitment physically, spiritually, emotionally and financially. As momentum builds, the risks increase. Don’t let your daily time with God falter. All the plans in the world are worthless without Him. Lock in your time with Him. Pray for His power, His wisdom and His direction. Remember, the power to press on in the challenging days of starting a new church is the same power source who calls you in the first place. He who called you is faithful. Ron Sylvia (@ronsylvia) is the founding and lead pastor of Church at The Springs in Ocala, Florida, and Director of NEXT Churches: Nuts & Bolts Church Planting (http://www.nutsandbolts.org). With over 3500 in weekend attendance, Church at The Springs meets in three locations. While leading a fast-growing church, Ron learned firsthand the value of mentoring & coaching. As a result, Ron started NEXT Churches, a national network of practitioners equipping planters and lead pastors to start & lead healthy churches. Ron is a Strat Op Facilitator of the Tom Paterson Strategic Planning Process, using the process to help pastors think & act strategically in the local church. He is the author of Launching a Purpose Driven Church conference curriculum and authored his story and methods in the book, Starting New Churches on Purpose. Ron & his wife, Teddi, are overjoyed to be surrounded with family in ministry, but especially love their two grandsons.